In a recent episode of Paula Deen’s show in Food TV, I saw her preparing a very easy peanut butter bread. Since I’m not a big fan of peanut butter I thought of making the bread with almond butter instead. 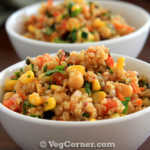 The taste was amazing and you won’t believe how easy it is to prepare. This almond butter quick bread looks amazing right! But do you want to bake an easy white bread recipe using yeast. Then this white bread recipe should be bookmarked. Preheat oven to 375F/190C for 15 minutes. 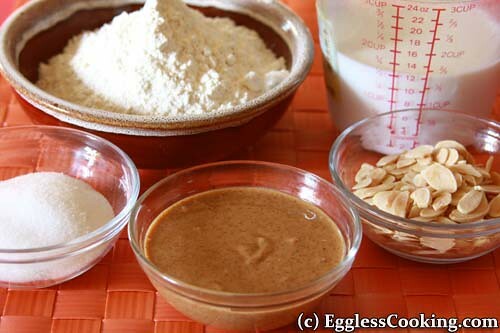 Combine the dry ingredients and nuts. 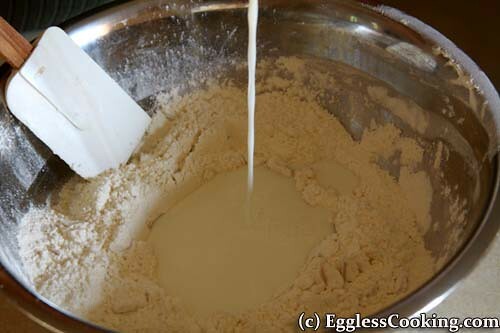 Add milk to the mix and stir well to avoid lumps. Now add the almond butter. Mix well and continuously stir them. 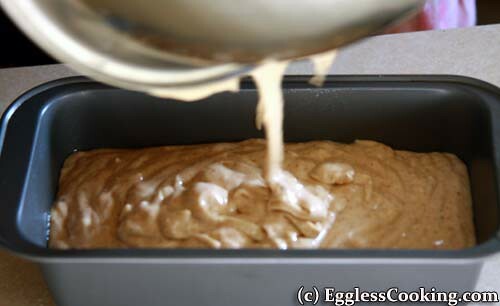 Pour into a 8x4x3 inch loaf pan. Top the batter with some toasted almond slices. 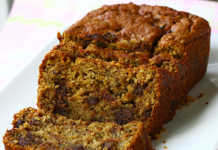 Have this for breadfast with or without jam. Enjoy! I happened to check the reviews in the food network site after baking the bread while writing this post. The recipe was given only 3 stars and most of them had written that the bread was too dry and did not have enough peanut butter taste. So they had suggested reducing the amount of baking powder, increasing the quantity of peanut butter, reducing the baking time, or using organic peanut butter because it has more oil content. But I did not have any problem with my bread. The only change I made was using almond butter and added a couple of toasted almonds. The bread was very moist and sweet enough by itself. Jam was also not necessary. The almond butter did have a lot of oil in it, maybe that gave the moistness to the bread. Adding toasted nuts in the batter gave a very nice crunch. But I wouldn’t top the bread with nuts the next time because they get toasted once again and some of the nuts became little bitter. 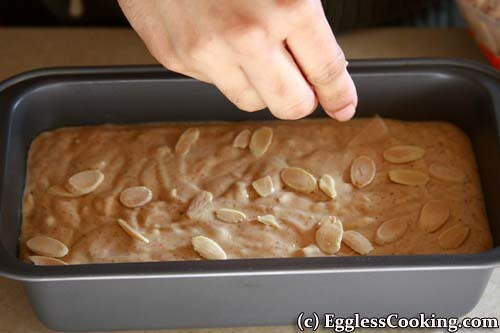 Not topping the bread with almonds will also facilitate easy slicing of the bread. Cool completely before slicing the bread, so that it does not crumble. I would even recommend to 2 to 3 hours of cooling. Also check out the health benefits of almonds here. 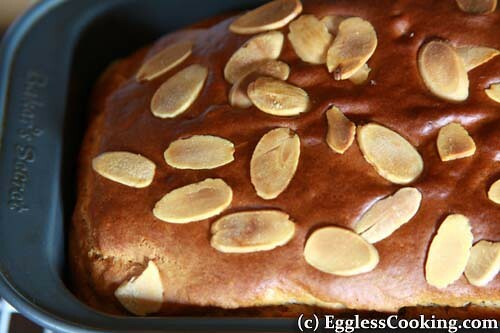 Update: My friend Roma from Bangalore, India has tried another cool version of the Almond Bread. 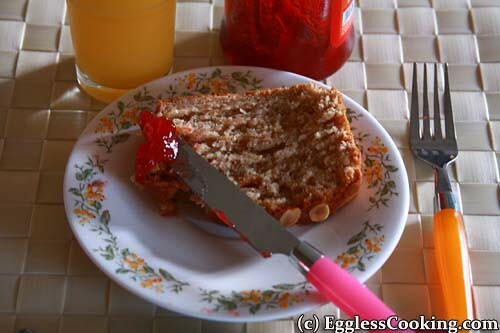 Since almond butter is not available in India she has used regular unsalted butter and has included powdered almonds and has got a very moist bread. I wan to bake this bread but couldnt find any almond butter here. How much amount of normal butter and almond powder I should use. And do I need to make other changes in the recipe. Why don’t you try it with peanut butter instead? I don’t think that your idea would work out well. But I read that you wrote as an update that your friend in India did that and it turned out well? Oh really!? I don’t remember it. Will have to check the post. Oh ok. Thank you for pointing it out 🙂 But I have to tell that I haven’t tried it. So unable to comment. I tried this yesterday. Very easy recipe, thanks for sharing this. I don’t know if it’s because I didn’t even out the batter after pouring into the tray, during the baking , the top layer with nuts for pushed to an angle and the batter under that rose high and even at 20mins into the baking the top got a little burnt. I still kept it for around 50 mins. My oven has only the gas marking and I set it to 5 after finding on the internet the equivalent of the temperature mentioned. Do you think it’s because of this ? 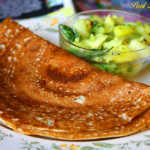 The taste is just awesome & i will definitely make it again. Also I found its moist and sometimes its crumbling as I slice it ( I left it to cool overnight and only sliced in the morning ). How can I avoid this next time ? 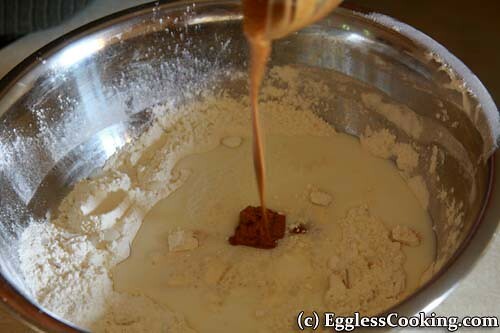 Tapping the pan after filling the batter helps to settle it down, removes air bubbles too. Also bread baking requires a little bit of tweaking because of the increased baking time. Sometimes you will have to loosely cover the pan with an aluminum foil after 20 minutes or so, so that the top doesn’t get burnt and the inside stays uncooked. By covering it with foil the bread will bake perfectly bother outside and inside. 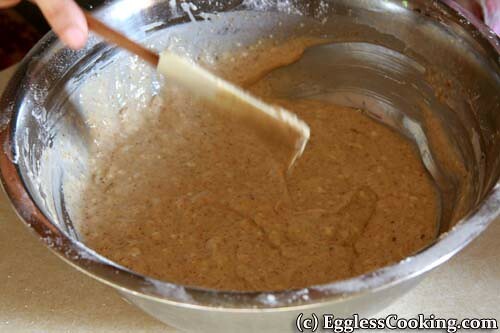 Yes leaving it overnight is a must for quick breads. Try using a serrated knife and making bigger slices. This worked well with sunbutter. I also added pumpkin bread spices. Can I use whole wheat flour instead of the white flour? Also for a gluten free version, would all purpose gluten free flour serve the purpose? What would you suggest? I wouldn’t suggest using whole wheat flour for this one. Maybe you should try 50% each of all-purpose and whole wheat flour. 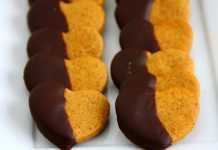 I have not tried this recipe using gluten-free flour, so don’t know how it would turn. Will using wheat flour as a replacement work ? any additional effort to be done to make it work, ? I would suggest either using whole wheat pastry flour or half each of whole wheat flour and all-purpose flour. Only few recipes work well with the flour replacement and I’m not sure that this is such a recipe. Came across your blog recently. 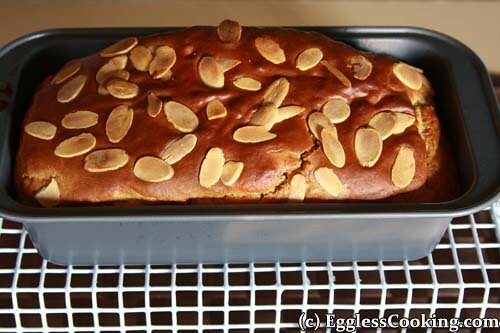 I was wondering if I can bake this almond bread with wheat flour instead..does that mean we use the Atta or is that a wrong assumption? I’m a beginner, so forgive me for the lame question. I want to bake this either today or tomorrow, so I hope to hear back from you by then 🙂 Thanks! No problem Deepika. Atta/whole wheat flour does not taste good in all recipes. The taste and texture of the baked good also depends on the brand of flour you use. 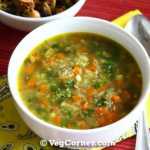 So you have to try it for yourself to see if you like a particular brand of atta for this recipe or any other baking recipe. Or the safest bet is to use whole wheat pastry flour. But most of the Indian store whole wheat flours (like Pillsbury, Deep, etc) are somewhat close to whole wheat pastry flour because they are milled from soft wheat. But I would’nt try the Golden Temple brand because I feel that it’s made from hard wheat. Yippee!!!!!!!! 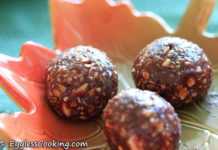 Amazing recipe and very easy one.. Believe me it was a great surprise for the family weekend breakfast. It was a major hit in the house.. I added almond powder instead of almond butter and also i added peanut butter which gave a crunchy taste with peanuts in between..
Keep posting more recipes which motivates us to try and enjoy the taste..
Hello, thank you for your recipes. 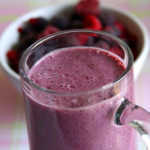 I am interested in trying this one, but I do not eat dairy, so what would be a good substitute for the milk? You could use any non dairy milk of your choice.